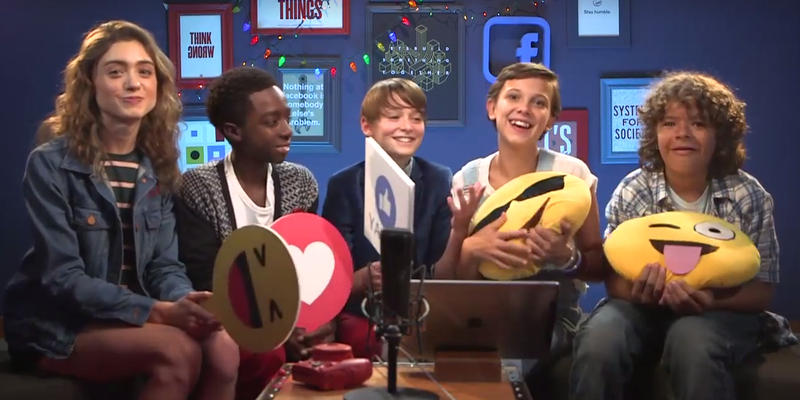 After season 2 of Stranger Things was officially announced, a few of the kids from the show (specifically Natalia Dyer, Caleb McLaughlin, Noah Schnapp, Millie Bobby Brown, and Gaten Matarazzo) sat down to test their ’80s trivia and (lucky for us!) also answered some fan questions on Facebook Live. It’s no secret that Stranger Things is heavily influenced by ’80s films. So, what is their favorite ’80s film? For Gaten (Dustin), there was a clear winner. Right there with you, Gaten! For Millie it’s E.T. (she was also told to relate her character, Eleven, to E.T. ), Caleb (Lucas) prefers Stand By Me, Noah (Will) seconds Gaten with The Goonies, and Natalia (Nancy) likes Sixteen Candles and The Breakfast Club. So which of them is the funniest? While Caleb and Gaten bring the silliness, Millie brings the sarcastic humor. Gaten and Caleb might be the silliest jokesters, yet the biggest pranksters on set were Noah and Millie. Not only did they prank the series creators (Matt Duffer and Ross Duffer) by pretending Millie was sick, they also pranked the costume designer with a story about her wedding venue being unavailable – which they even took time to script! Impressive. And which item would they choose to take home from set if they could? We’re definitely looking forward to more cast live streams and fan Q&A in the future!